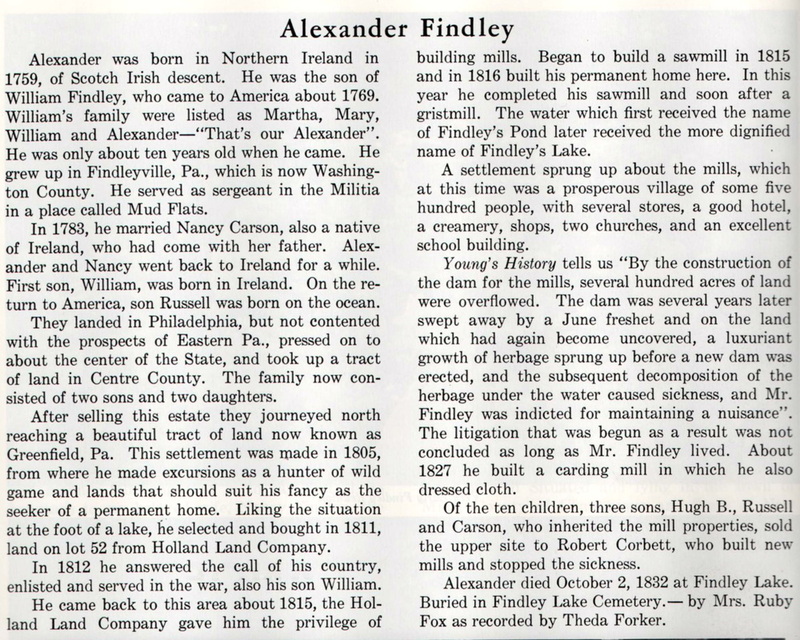 Findley Lake & Mina Historical Society - Story of Alexander Findley and the naming of Findley Lake. Hours Open Sat 9-12 and most Tues For different times or appointments please call. ﻿The " Daisy" pictured above owned by Christian and Will Chum was one of the steamboats that sailed on Findley Lake at the turn of the century. Steamboat appearance paralleled the opening of The Lakeside Assembly in 1895-1915 which was patterned after Chautauqua . This is an absolute beautiful stepback cupboard that is being given to the Historical Society by a direct descendant of Alexander Findley. It will be one of our most treasured artifacts we have and one we will definitely show off to all our visitors. Mary will give us more details on the gifts we have received from Margaret Fox Chmiel from Michigan. Our President Mary Norcross informs us the Heritage Room at the Community Center has become crowded so she has set up displays of the collection from the Veterans of WW1,WW2,Korean and Vietnam Wars across the hall in the Town Historians room. Also displayed are the personal affects of Maude Skinner . She was a native of Mina and teacher for 49 years starting her career in a one room school at Mina Corners, then moving to the grade school connected to the high school on School Street then finally to the Findley Lake Grade School which is now our Community Center. You can see all the photo's of the history of our little school and many of the students who passed through the doors. Our President Mary Norcross has been appointed Town Historian so this should make a seamless historical area for our community. This historical website for Findley Lake and the Mina area is our attempt to better disseminate historic information to our friends and people who are interested in our area . When material is presented we have not attempted to embellish or change in anyway what was given to us for the history of our area. If notations are unreadable or would not digitally scan well we will attempt to interpret if possible and follow word or phrase with a ? We will list what pertinent facts we have available, and attempt to give information about the material. Our small community has many long time residents with fond memories. They have given freely of their photo albums, biographies and other historic material. Many families can trace their history back to the early 1800's when our area was just a wilderness. We find that this material is difficult to display at our small museum located in the Findley Lake Community Center. It is our hope that this site will augment and make it easier for people to access this material. We do not know if we will be successful, but it will be our attempt and you will be able to watch our site grow and improve. We hope you will give your comments and suggestions freely for this site is for you. History is like knowledge in that it has little value unless you can disseminate it to others. Findley Lake is part of French Creek, one of the most bio-diversified creeks east of the Mississippi River. At one time our creek flowed north into what was then the St. Lawrence River but during the Glacial period reversed its flow and now flows south down to Pittsburgh and eventually into the Gulf of Mexico. This change combined two different ecosystems creating the great biodiversity. Findley Lake is considered to be second only to Chautauqua Lake in the county in beauty and recreational value. You cannot help but wonder, did Mr Findley ever realize the true beauty of the wonderful lake he made before he passed away. He was in litigation up until the day he died, indicted for keeping a nuisance that caused people to be sick. The cause of which was not in his control. We have to say he created a beautiful and wonderful lake that we can enjoy for all the generations to come, thanks to one man, Alexander Findley.